Today was an intense day of hydrography survey work! I received an introductory course to all the survey research that is done on the ship. The morning began with computer system problems – something that took teamwork and troubleshooting to fix. The system that logs data as the ship moves through the water was unable to track the ships movements. It was a team effort to get the system up and working again, but they were eventually successful. As the ship moved through the Gorman Strait collecting data using a transducer that send multiple beams to the ocean floor the technicians were able to show me how they read and interpret that data. It is a complex process with many computer screens and complicated programs. I am glad I was not in charge! Every few passes through the Gorman Strait we were also required to take a sample of the conditions of the ocean floor. A machine called an MVP (moving vessel profiler) is used to do that. Unfortunately this piece of equipment would not cooperate with us either and we were forced to use the manual version of the MVP called a CTD (conductivity, temperature, depth) device. Each instrument does the same thing in sampling the conditions on the ocean floor, but the benefit of the MVP is that the ship is not required to stop to collect data when using it, hence the name moving vessel profiler. 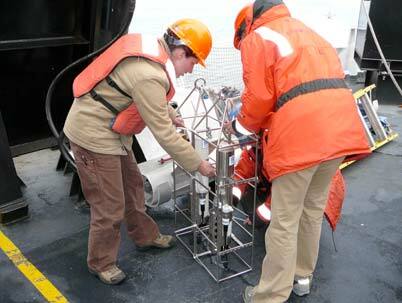 The CTD on the other hand cannot be trusted to give accurate data while the ship is in motion. It is also operated manually; therefore several people need to be on hand to assist in its deployment into the water. I was able to help in this task. By the end of the day we had nearly finished surveying the Gorman Strait and completed several CTD deployments leaving us with a lot of data that needed to be processed later that evening. 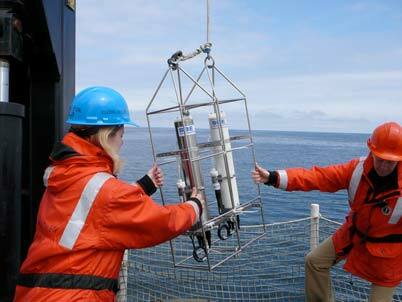 Megan and I bring the CTD safely back to the ship. It was very interesting and fun to be part of the scientific research that went on today by surveying the Gorman Strait. I truly felt like I was accomplishing something of value, something that Alaskan fisherman and the cruise line industry will be able to use for years to come. It was great to be part of a team, working together to complete a task, just the way science students work in the laboratory to complete lab activities. After acquiring the data from the CTD (conductivity, temperature, depth) device, we were able to produce a graph comparing the sound velocity (the speed at which sound travels) and the depth of the water. We found that as we lowered the CTD further into the water (increased the depth) the sound velocity decreased. What type of relationship does sound velocity have to depth? What would you expect to happen to the sound velocity as you raise the CTD out of the water (decrease depth)? 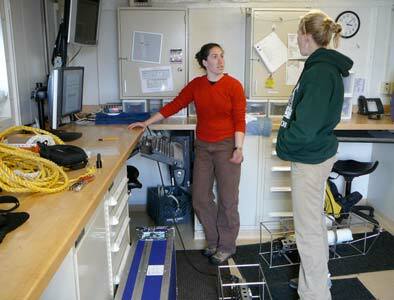 In the O-Lab, Stephanie and Megan begin to process the data that we collected. 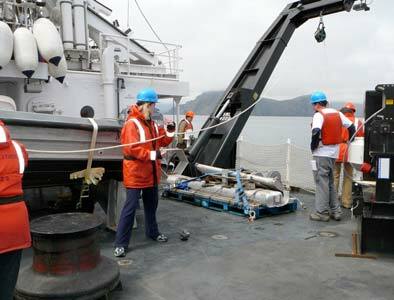 This entry was posted in 2006, Lisa Kercher, NOAA Ocean Service, NOAA Teacher at Sea and tagged Alaska, CTD, fisheries, Hydrographic survey, navigation, NOAA Ship Fairweather, sonar. Bookmark the permalink.